A Pacific Ring-necked Snake is found under a log in the woods and is filmed on an old picnic table before being released to crawl back under its log. 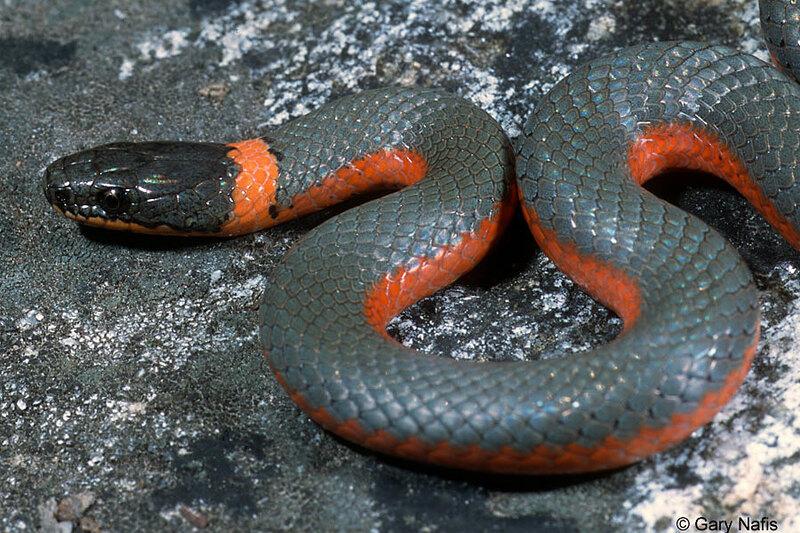 A Pacific Ring-necked Snake is found under a board in a forest clearing and demonstrates how quickly it can move. A few brief views of a large San Diego Ring-necked snake and its habitat. 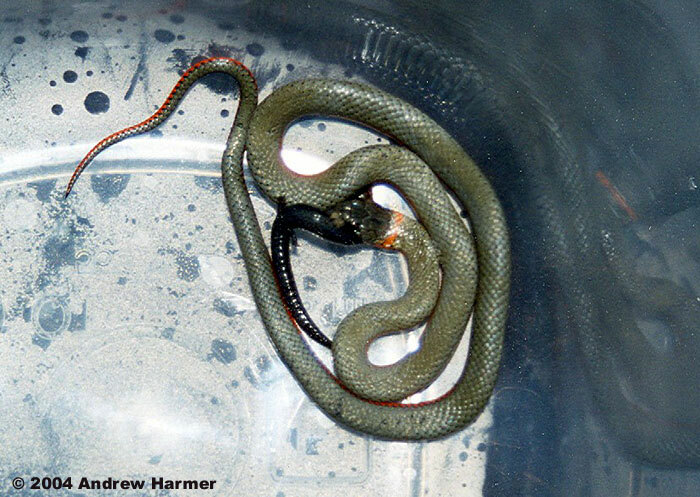 A San Diego Ring-necked snake is released back where it was found. Mildly venomous. Not considered dangerous to humans. Enlarged non-grooved teeth in the rear of the upper jaw and mild venom which may help to incapacitate small prey. Hatchlings are much smaller and longer specimens are sometimes found. 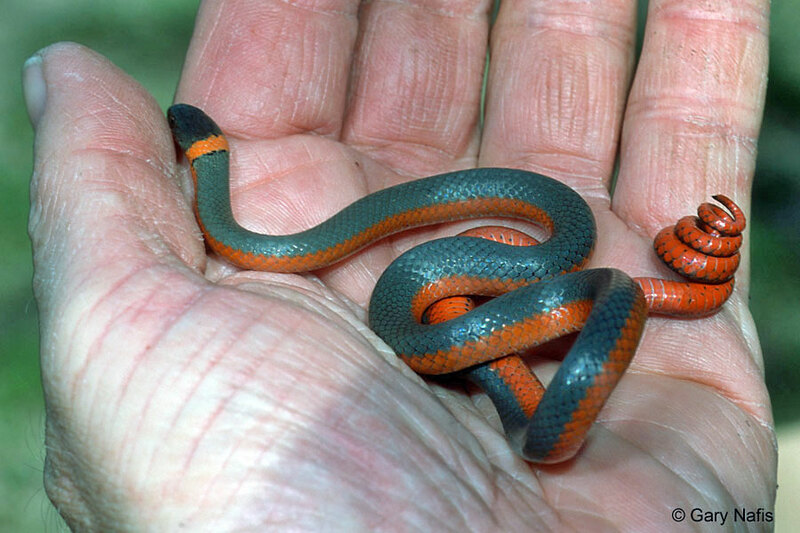 A small, thin snake with smooth scales. Gray, blue-gray, blackish, or dark olive dorsal coloring, with a pinkish-red or coral-colored underside that is unmarked or lightly speckled with black markings. The underside of the tail is a bright reddish orange. An orange band circles the neck. Secretive - usually found under the cover of rocks, wood, bark, boards and other surface debris, but occasionally seen moving on the surface on cloudy days, at dusk, or at night. When disturbed, coils its tail like a corkscrew, exposing the underside which is usually bright red. It may also smear musk and cloacal contents. Eats small salamanders, tadpoles, small frogs, small snakes, lizards, worms, slugs, and insects. The mild venom may help to incapacitate prey. Lays eggs in the summer, sometimes in a communal nest. 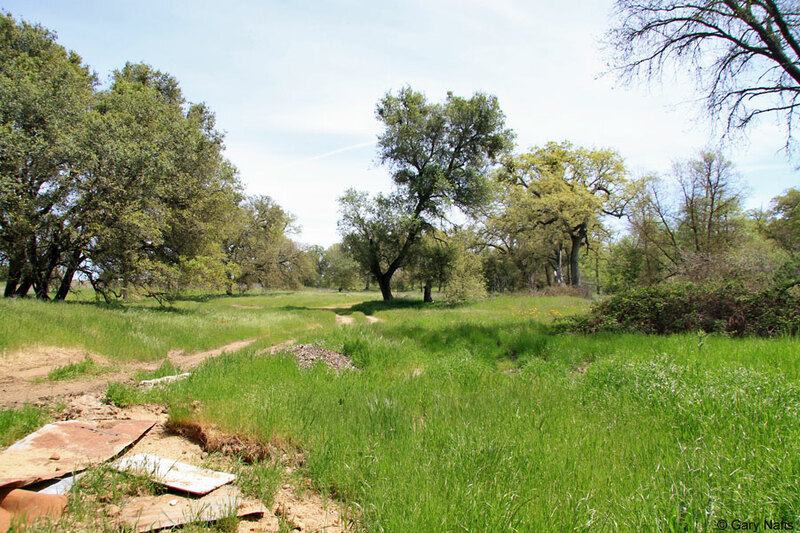 Prefers moist habitats, including wet meadows, rocky hillsides, gardens, farmland, grassland, chaparral, mixed coniferous forests, woodlands. 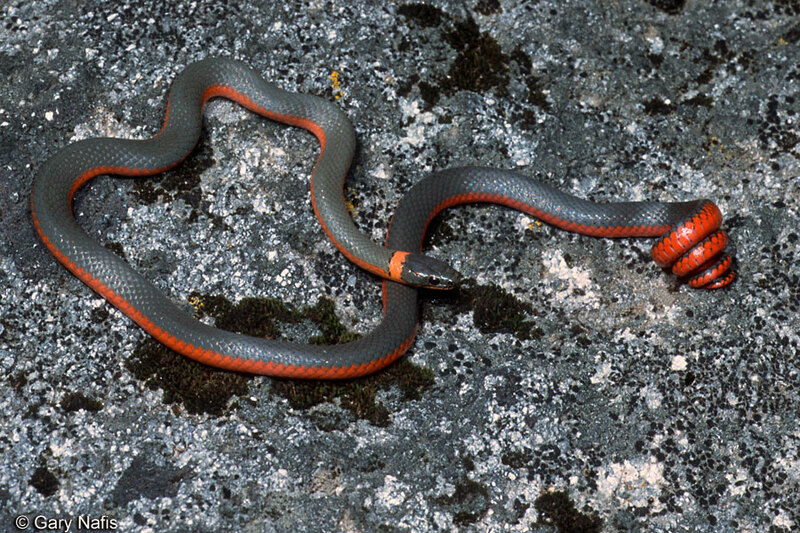 This subspecies, Diadophis punctatus pulchellus - Coral-bellied Ring-necked Snake, is endemic to California, occurring along the western slopes of the Sierra Nevada Mountains, where it intergrades with the Northwestern Ring-necked snake in the north, and the Monterey and San Bernardino Ring-necked snakes in the south. 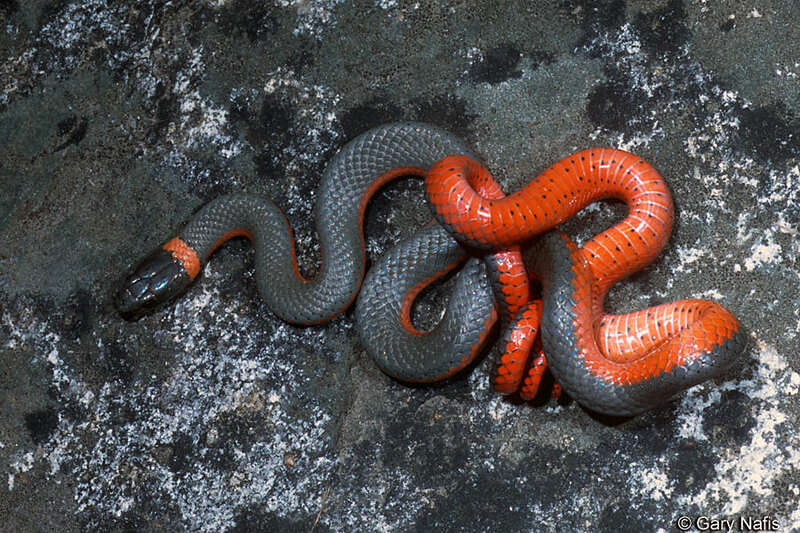 The species Diadophis punctatus - Ring-necked Snake, has a very wide range, occurring along the entire east coast of the United States west to the Great Lakes and southwest from there through the Midwest into Arizona, with scattered isolated populations throughout most of the western states including the western half of California, Oregon west of the Cascades, and south central Washington. 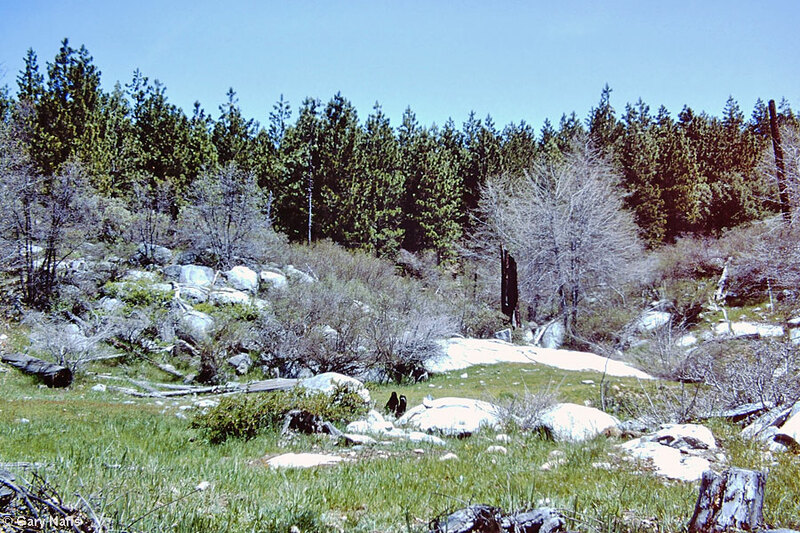 In 2010 a ring-necked snake was found on the eastern slope of the Sierra Nevada (where it had not been found before) .5 miles east of the Inyo/Tulare county line, making it only the second of this species recorded in Inyo County. Many herpetologists no longer recognize the traditional morphologically-based subspecies of Diadophis punctatus, pending a thorough molecular study of the whole species. One ongoing study (Feldman and Spicer, 2006, Mol. Ecol. 15:2201-2222) has found all of the D. punctatus subspecies in California (except D. p. regalis) to be indistinguishable. It is likely that D. punctatus is composed of several distinct lineages that do not follow the geographic ranges of the subspecies. In a phylogeographic analysis of the species, Fontanella, et. al. (2008) identified fourteen lineages of Diadophis punctatus. They did not recognize these lineages as separate species, pending a full taxonomic review that will require further dna sampling and evaluation including Diadophis populations in Mexico. * An eastern California lineage, which includes the Coral-bellied subspecies, D. p. pulchellus, and some of the northern intergrades with D. p. occidentalis. * A Coastal California lineage, which includes the Monterey subspecies, D. p. vandenburghi, the Pacific subspcies, D. p. amabilis, the Northwestern subspecies, D. p. occidentalis, and snakes from one region of the western Sierra Nevada currently recognized as D. p. pulchellus, along with the southern intergrades in the Tehachapi mountains region. * A Great Basin lineage which presumably includes the Regal subspecies, D. p. regalis, found in isolated locations in the eastern Mojave. A rough interpretation of the ranges of these four lineages is illustrated in the map below. Diadophis - Latin - diadema - crown and Greek -ophis - snake -- "generally w/a light ring on the occipital region." Fontanella , Frank M., Chris R. Feldman, Mark E. Siddall, & Frank T. Burbrink. Phylogeography of Diadophis punctatus: Extensive lineage diversity and repeated patterns of historical demography in a trans-continental snake. Molecular Phylogenetics and Evolution 46 (2008) 1049–1070. 2008.